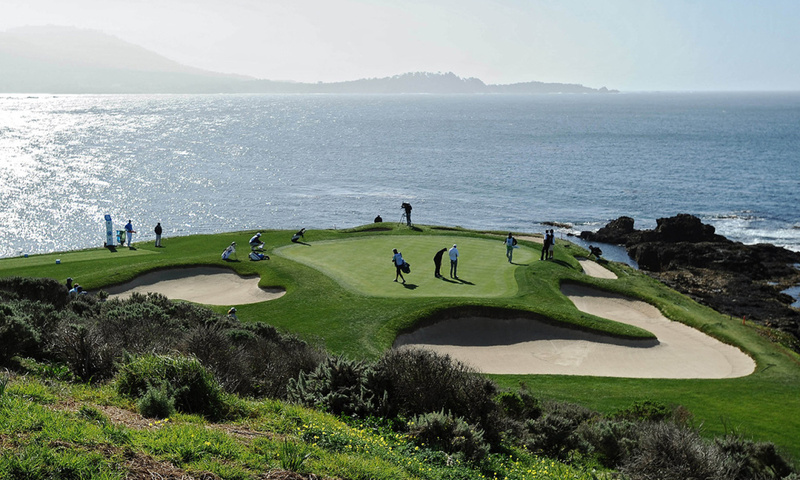 PEBBLE BEACH PRO-AM: The lovely Monterey Peninsula gets its annual turn in the spotlight this week when PGA Tour stars and a whole host of celebrities and golfing dignitaries take to the region’s three most iconic courses for the AT&T Pebble Beach National Pro-Am. As always, this event will be a Pro-Am for the first three days, with each team getting a crack at Pebble Beach, Spyglass Hill, and Monterey Peninsula Country Club before all the action moves to Pebble on Sunday for a pros-only final round. The pro-am format is challenging for some, as the pace of play is slower and the atmosphere is a bit more casual than most weeks, but friendly course setups, enthusiastic crowds, and the sheer beauty of the courses and surrounding area combine to make this one of the more player-friendly stops on Tour. This ain’t Memphis in June, if you know what I mean. As one of the most revered courses in the game, the main attraction here is Pebble Beach. A modified links-style course that sits right on the Pacific Ocean and boasts iconic views of the rocky coastline, Pebble has played host to five U.S. Opens and a PGA Championship, and the U.S. Open will return for a sixth time later this year. It’s a shortish track that features generous fairways and small, knobby, poa annua greens, but if the wind starts whipping, as it often does, it can be quite treacherous. That said, we’ll probably have to wait until June’s U.S. Open to see the course truly bare its teeth, as this week is generally a birdie-fest due to the generous setup. The other two courses that the players will see this week– Spyglass Hill and Monterey Peninsula– are both on the shorter side as well, though the tree-lined Spyglass has some trickiness to it and generally plays as the most difficult of the three. This tournament can be a bit difficult to predict, as two of the past three champions– Ted Potter last year, and Vaughn Taylor in 2016– were triple-digit longshots who had been showing no signs that such a performance was forthcoming. But a handful of guys play well in this event every year, and those who are most comfortable with poa annua greens– looking at you, Dustin Johnson and Brandt Snedeker– seem to fare especially well. Tony Finau (21.0)- Though he missed the cut in Phoenix last week after back-to-back 72s, I wouldn’t be too concerned about the state of Finau’s game– just two weeks ago he finished 13th at the Farmers Insurance Open, breaking par in all four rounds, and he’s found the top-20 in 4 of his past 6 starts overall, including a pair of runner-ups. His length off the tee will provide a distinct advantage at both Pebble and Monterey Peninsula, and Finau has had success in this event before, finding the top-25 in his only previous appearance (2017). Moreover, according to the guys at Future of Fantasy, Finau has been one of the best in the world on poa annua greens over the past few years, ranking 7th in strokes gained among players who have logged at least 30 rounds on poa annua since 2014. He should be viewed as one of the favorites this week and I’m happy to back him at 20/1. Rafa Cabrera Bello (62.0)- Cabrera Bello’s game has blossomed over the past couple of years and he’s now a threat to win anywhere, at any time. He’s been playing beautifully since last summer, finding the top-20 in 9 of his past 13 worldwide starts, a stretch which spans three different tours and four different continents. His most recent success came three weeks ago in the UAE, where he finished 11th in the Abu Dhabi HSBC after a Sunday 67, and prior to that he finished 6th in Hong Kong. In other words, Cabrera Bello’s game travels, and he’s certainly a good enough ball-striker to dominate all three of the courses he’ll see this week. While he’s not a great putter, his numbers on the greens have improved over the past 24 months, and he rolled it pretty well in this event last year en route to a T26. At a price like 62.0, Cabrera Bello is one of the best values on the board this week and should be backed enthusiastically. Doug Ghim (106.0)- Though he’s only 22 years of age, Ghim has quickly made a name for himself in the world of golf, first as a top-ranked amateur, and over the last few months as a professional. And “top-ranked” is probably putting it a bit too delicately– Ghim was the single best amateur in the world prior to turning professional last year, and now he’ll look to do what a handful of young phenoms before him have done: attain PGA Tour status through sponsor’s exemptions. To do so, he’ll really have to take advantage of the opportunities he’s given, but he’s off to a good start in that regard, finishing 20th at the Farmers Insurance Open two weeks ago. And his week at the Farmers could’ve been even better, as he was in solo 4th through three rounds before a disappointing Sunday. He bounced back in style last week, however, finishing 3rd in the Web.com Tour’s Bogota Championship, a performance which included a stunning second-round 61, and now he gets a crack at Pebble. This kid is an elite talent, and he surely comes in with lots of confidence this week based on his recent results. Don’t be afraid to throw a bet his way at better than 100/1.